Until recently, Venezuela's opposition was so weak and fragmented it seemed unable to even fathom an electoral victory. But, in the early morning hours on Monday, it sealed a surprising triumph over the constitutional reform proposal of a President who, in nine years, had never lost an election. Scrambling to explain this aberration in a land where Hugo Chavez dominates the political landscape, many political observers point to the thousands of university students, who, dormant until this year, clogged the streets to protest the reform in the weeks leading up to the vote. Raul Baduel, the former defense minister and longtime ally of the President, also injected life into the opposition when he, along with the former pro-Chavez party Podemos (Spanish for "We Can"), called for people to vote no. But the results raise another, perhaps more important, question: how much help did the opposition actually receive from the poor, Chavez's main support base? It used to be a given that Chavez could count on the lower class, which represents the majority of the population, to turn the vote his way. 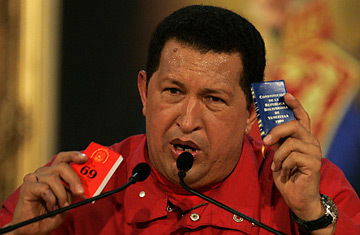 Clearly, after logging 49% of the vote for his controversial reform, Chavez still has many of the poor on his side. The electoral council has yet to release detailed results that would indicate how impoverished areas voted. But an abstention rate of 44% suggests some of Chavez's traditional support base didn't show up to vote. And, narrow as the vote count was, the rejection of his proposal only one year after he won reelection by a margin of over 20% raises the possibility that abstention was compounded by some supporters actually voting no. If, as interviews in Caracas this week suggest, more people in barrios disagree with Chavez's political agenda, that's worrisome for a man whose political raison d'etre is defined by alleviating poverty. Early this morning, the capital was a surreal site for Venezuelans who had begun to believe Chavez was invincible at the ballot box. Most chavistas who celebrated early in front of the Miraflores presidential palace abandoned the party when the voting results were announced at 1 a.m., leaving a sparse crowd with long faces milling about in a sea of empty rum and beer bottles. A large inflatable bust of Chavez with his arms outstretched lay face-down and half-deflated on an empty stage. A man who looked drunk held up several soggy and torn "Yes" posters in front of a giant projection screen showing the President conceding defeat. Meanwhile, across town in wealthier Altamira, Chavez opponents who had seemingly forgotten how to rejoice clogged streets, set off fireworks and exchanged embraces. As the mostly student crowd chanted and played drums outside the opposition campaign headquarters, newspaper editor and former presidential candidate Teodoro Petkoff flashed a wide smile. "Last week it was evident there was a transfer of people who usually vote for Chavez, and they defeated it," he said. As the vote took place, many in the Caracas slum of Petare said they opted for "Yes." But there were clearly naysayers. "The majority here will vote no," 51-year-old Maria Negrin said after voting in Petare on Sunday morning. "I don't agree with giving all the power to the President." Others said they wanted to vote against Chavez's proposal, but felt obligated to vote yes because they benefited from government social programs. Poor voters unhappy with the proposed constitutional overhaul said they were more troubled about measures to abolish presidential term limits and facilitate state expropriation of private property than they were enthused by articles that could benefit the poor, such as social security for informal workers and popular participation in government. That begs the question: did Chavez sacrifice measures that could have helped the poor because he insisted on a political power grab? Arlenis Espinal is a university professor at Simon Rodriguez University and a community leader in the lower-class Caracas neighborhood of 23 de Enero, traditionally a bastion of Chavez support where the President himself votes during elections. Espinal, who has been fighting for social change since the 1970s, at times amid police repression, says more people in her area abstained or voted against the President than in last year's election. "The proposal that the President makes needs to be built more collectively," Espinal says. "Socialism can't be understood in only one way. People have many doubts, and that is natural when there is a transition. The Venezuelan people need more time to build a proposal." Despite the defeat, Espinal called the vote a "strategic victory" that could help the revolutionary process modify its approach. Both Chavez supporters and opponents said in interviews before the vote that they didn't believe the no vote had a chance. Despite that atmosphere, and a persistent opposition conviction that the results could be fraudulent, the nascent student movement helped galvanize many detractors to vote. When students took to the streets to protest the forced shutdown of the opposition-aligned television station Radio Caracas Television earlier this year, the country had all but forgotten that the universities were one of the very few sectors of society left that was not yet controlled by the government. On that occasion, young people staged their largest protests after the TV station had already gone off the air. But this time around, they hit the streets in advance of the referendum, leading tens of thousands to protest in Caracas and thousands more in other cities throughout the month of November. Indeed, some of Venezuela's poor hit the streets this week for student-led protests rather than pro-Chavez rallies. Luis Escobar grew up in Plan de Manzano, a poor clutter of homes that hang precariously from a hill along an old highway connecting Caracas with the Caribbean coast. He studies telecommunications at UNEFA, a university run by the Armed Forces that often drapes an enormous poster of Chavez over its main building. "People say UNEFA is 100% chavista, but that's not the reality," Escobar said. He attended the opposition's final march on Thursday sporting a university shirt, defying possible reprisals from school directors. "Many friends of mine told me not to put on the shirt because I was already threatened, because they could throw me out of the university," he said at the rally. "They're not going to tie me down or inculcate me with something I don't agree with." The electoral defeat may indeed slow the President down, but he and his allies still have wide-reaching powers that include control over the legislature, the judiciary, the state oil company and nearly every state government. The students say they know their battle is far from over. "The student movement has said that December 2 isn't an end date," Ricardo Sanchez, a student leader at Venezuela's Central University, said on Sunday at opposition headquarters. "On the contrary, it's a beginning. It's a beginning point for the good things that can be coming for this country."